We all want our little ones to feel better when they are teething, but many parents are concerned about giving too many harsh chemicals. Traditional over-the-counter teething medicines use chemicals like Benzocaine or Simethicone to mask symptoms. Similasan works differently, by using natural active ingredients to stimulate the body's natural defenses so your little one can feel better without harsh chemicals. Formerly called Teething and Tooth Support. Same great ingredients! Q: What age can I give my baby Similasan Baby tablets? A: Similasan Baby tablets are formulated for infants and babies of teething age. There is no minimum age. The mini tablets dissolve in about 10 seconds once placed in the mouth. Q: Can I give Similasan Baby Gum Relief tablets to my baby even when they aren't teething? A: Yes, it is okay to give these to your child to support the growth of new teeth. Q: Does the Baby Gum Relief tablet contain Benzocaine? A: No, Similasan products are made without harsh chemicals like Benzocaine. Q: Can I give these to my child if I have given them acetaminophen? A: Yes, it is okay to give Similasan products alongside other traditional medicines. 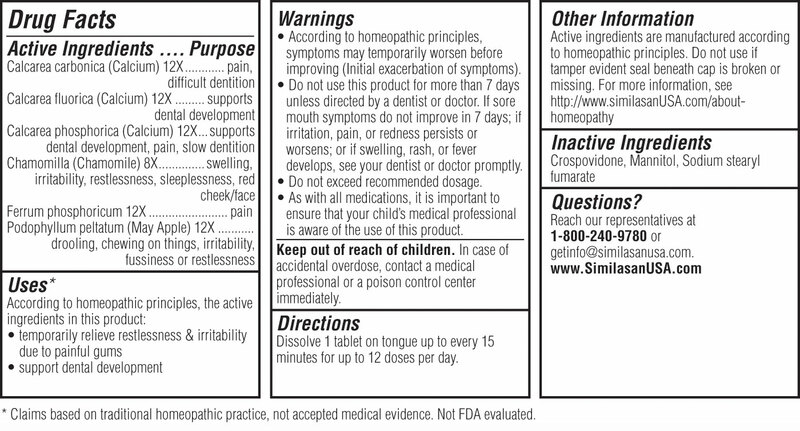 Our products do not contain acetaminophen. Q: How quickly do they work? A: Each person reacts differently to homeopathy. Some will receive immediate relief while it may take longer for others.